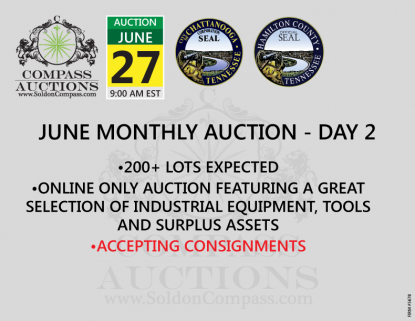 Compass Auctions & Real Estate will host an ONLINE ONLY auction event starting at 9 am EST on 6/27/19. Registration is available and open now. This 200+ lot auction will feature a wide selection of job site tools and equipment – a great opportunity to pick up construction and contractor grade equipment! Consignments are encouraged and being accepted for this auction!